Dr Maryanne Demasi investigates the bitter truth about the dangers of a sweet diet. This is an old video, it is saying things that must have been controversial at the time. For most people this is still new understanding. In only a few decades, there are now more obese people on the planet than there are undernourished. When it comes to getting fat, we've been TOLD, and most of us BELIEVE, it's as simple as 'calories in' versus 'calories out.' If you want to shed the kilos, you need to burn more calories than you consume. Most people think that means eat less of exercise more. These beliefs are just indoctrination; there's no science behind it, even if the person proclaiming that belief is a scientist, or dietitian, or a medical doctor. Link to the video on Youtube, if the above video won't play in your region. Not all calories are the same. Some people absorb calories more efficiently and it matters what types of foods your calories are coming from. Sugar is the dietary villain that's making us fat and sick, as UK physiologist and nutritionist, Dr John Yudkin tried to tell us more than 50 years ago. [From Wikipedia] From his book "Pure, White and Deadly" (1972). The last paragraph of Chapter 1 begins "I hope that when you have read this book I shall have convinced you that sugar is really dangerous." "It is clear that Yudkin has no theoretical basis or experimental evidence to support his claim for a major influence of dietary sucrose in the etiology of CHD; his claim that men who have CHD are excessive sugar eaters is nowhere confirmed but is disproved by many studies superior in methodology and/or magnitude to his own; and his "evidence" from population statistics and time trends will not bear up under the most elementary critical examination." The efforts of the food industry to discredit the case against sugar were largely successful, and by the time of Yudkin's death in 1995 his warnings were, for the most part, no longer being taken seriously. Honey is not a more healthy form of sugar. Most sugars once in the body are processed in one way, they are converted into glucose, and used as energy with any surplus converted to adipose white fat deposits. All these sugars use insulin to enable their transport into body cells, or conversion into fatty acids. Fructose and alcohol sugars often used a sugar substitutes, are metabolized almost completely in the liver in humans. This process avoids the insulin pathway. Fructose is directed toward direct replenishment of liver glycogen and to triglyceride synthesis. The products of fructose metabolism are liver glycogen and de novo lipogenesis of fatty acids (Fatty liver deposits). The problem is bigger than sugar in the diet. All of the vegetable based foods we eat have a little carbohydrate in them. Grains are especially high in energy and despite all you've been told, relatively low in nutrition value. Grains are low cost, sources of calories. If you want to buy calories rather than nutrition grains are clearly the obvious best source. Grain based foods are profitable. Take corn, the cheapest food on the planet, convert it into crunchy flakes, add some sugar and sell it for ten times what it costs to produce. There are hundreds of versions of that model, sold as bread, muffins, buns, biscuits, cakes, pasta, pastries, the sort of thing most people eat all the time. So much so that people can't imagine living without ANY of those foods. For 30 years I ate a non-cooked breakfast. Muesli (sometimes with honey), low-fat yoghurt and fruit, with added low-fat milk. Occasionally supplemented by toast, margarine and peanut butter. This breakfast has a Heart Foundation good health "tick." Sadly, it's not healthy. Today, none of that content is part of my breakfast. My aim at breakfast is not to stimulate the production of insulin. Instead I want to effectively continue my overnight fast, and also to eat well. 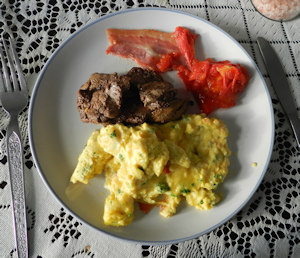 The basis of breakfast is fatty meat and eggs. Vegetables are a desirable addition, avocado, tomatoes, mushrooms, kale, silver beet, or even lettuce. Offal meats or seafoods are a welcome addition. If I eat any food at all with higher carbohydrate content, during the day, it's likely to be at dinner, in the evening. The only problem I have is at business meetings, morning or afternoon teas. Typically no real food is ever provided. Sometimes you can't even get real butter. This is disgraceful, but that's what's easy to do, and it's become what people expect. Obesity isn't in the person, it's in our whole society, in the way we all think. In what we all accept as "normal." So we get fat, by making wrong dietary choices, sometimes because we seem to have no option. The most damaging fatness is invisible. Visceral fat; that is the fat created by your liver that collects inside and around your internal organs. As this fat builds up your organs find it more and more difficult to be efficient. Fatty liver has no symptoms until it gets quite serious, but that's 20 years after the problem began. We don't know how many people at age 50 have nor-alcoholic fatty liver disease, because we never test for it, but maybe almost everyone. Dr Tim Noakes tells us that it's probably the most under-diagnosed problem in medicine. On the basis of current statistics, young people today will live shorter lives than their parents. They are fat 20 years earlier than their parents, and huge numbers are diabetic. This is entirely unnecessary. But to make effective change, our whole society has to develop quite different ideas about what a healthy diet looks like.